As part of its continuum of care, The Normandy offers dedicated memory care in Edie’s Place at Lakeside Assisted Living. 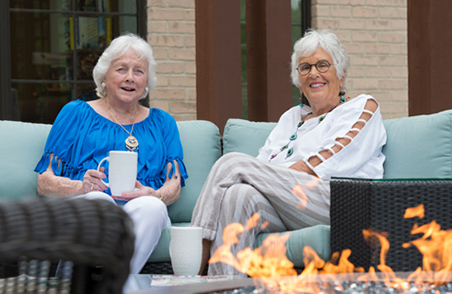 Edie’s Place is composed of 40 unique suites designed specifically to support those coping with Alzheimer’s or dementia. You or a loved one can settle into a comfortable, friendly, and homelike environment where every detail has been thoughtfully considered. The memory care staff are Certified Dementia Practitioners, specializing in Alzheimer’s and dementia care, and their unique sensitivity and skills help make each day meaningful for your loved one. 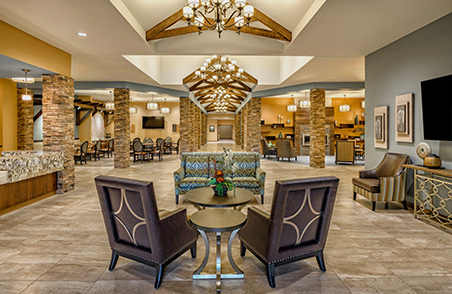 Normandy staff ensures that residents are safe and comfortable in their environment while enjoying the amenities of The Normandy campus, including state-of-the-art Snoezelen rooms in each memory care unit, and outdoor enclosed courtyards with beautifully landscaped designs. Using a person-centered approach, caregivers are available 24 hours daily to provide personal and psychosocial support, while coordinating Medical care and communicating with the residents’ health care providers. 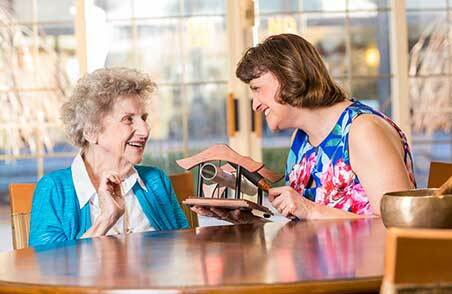 Lakeside Memory Care staff is specially trained in Alzheimer’s and dementia care. Designated activities professionals are available on site each day to provide individualized programming and interactions where residents can both reminisce and enhance their life skills. Our state-of-the-art Snoezelen room delivers sensory therapy that soothes memory care residents. With the use of laser projections, aromatherapy, multi-colored lighting, audio tracks and more, the Snoezelen room incorporates a variety of interaction to create a safe, relaxing atmosphere while stimulating cognitive functions and improving residents’ mood, trust, and self-esteem. The entire Baker Family want to thank you for all the loving, compassionate, tender care that you gave Dave in the course of his long stay with you. I was an observer on almost a daily basis and I never once saw anyone get angry or upset with any of the patients. You were truly tested minute by minute each and every day. You were my ‘other world’ for over two 2 years and I never felt anything but kindness for me as well as for Dave. You are very special people, doing a very special kind of care! We had an excellent experience at the Normandy Care Center. We were an involved family and all staff were responsive to us. The staff seemed happy working there and got to know our dad as a person. It is hard to have a loved one in a SNF, but dad’s stay went well. Also, all of our concerns were addressed in a timely manner. Thanks for the superior and comprehensive care The Normandy Care Center staff provided me. I am stronger and happier because of all of you. Dear Kenny, My mother and I would like to thank you so very much for everything you’ve done for us, working so hard to get our J.H. long term care insurance started. It’s been an ordeal, and we really appreciate all the effort you put into the process. I couldn’t have done anything without all the terrific help you gave me. Hopefully everything will go more smoothly, and thank you again for all your thoughtful care and always being there for us! Just a quick note thanking you and your team for making Mom’s 100th birthday so very nice. The party was special and the articles highlighting her birthday and her life were great. Family members are enjoying them. Thanks for everything you do for mom.